Without fail 1-2 times a year I get suckered in by a PR campaign and this year it is “Birdman The Unexpected Virtue Of Ignorance” being the full title but being known as “Birdman”. The film is being herald as a movie making technical feat, acting at its best, plus definite Oscar nominations for Michael Keaton and Edward Norton in some of the lesser media oversell. I bought in to it! Keaton is a one time movie star who became famous playing the superhero Birdman who decides to come to Broadway in a play he has written, is producing, directing and is starring in for a comeback. Playing opposite is another film star (Naomi Watts) making her Broadway debut and Mike Shiner (Norton) a method actor who believes you use a real gun in a scene when he is going to be shot and drinking real gin on stage. Also involved is Laura (Andrea Riseborough), Keaton’s sometime lover, his daughter Sam, (Emma Stone) just recently out of rehab being her Dad’s assistant, his ex-wife Sylvia (Amy Ryan) and his attorney Zach Galifianakis. It has been described as a comedy/drama, a first rate back stage story but regarding the former I laughed once and as far as the latter comes nowhere near “All About Eve”. There is one scene far fetched scene where The New York Times fictional critic, played by Lindsay Duncan, tells Keaton she will destroy his play, and him, for having the nerve to come to Broadway for his comeback. Yes Keaton does a good job with what has to work with, Norton has some good moments but it is Emma Stone who makes the strongest impression. Director Alejandro G. Inarritu, who co-wrote the film with Nicolas Giacobone, Alexander Dinelaris and Armando Bo, also produced it. His gimmick, working with his cinematographer Emmanuel Lubezki, making it seem like the movie, even though taking place over a few days, was filmed in one continuous take and is very successful at it. The music, mainly drumming by Antonio Sanchez, at times is affecting but most of the time annoying. 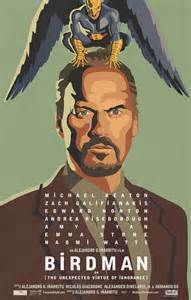 I may wind up in the minority, and Keaton and Norton may get the Oscar nominations that are being talked about, but as a comedy or a drama or a satire “Birdman” doesn’t rate a worth seeing from me.